Alan took the forks away to seek enlightenment from work colleges whilst I pursued perfect paint. Three attempts to re-colour one side panel all ended in failure before I decided to leave a couple of days between coats; it worked. After a gentle ‘flat’ with 1500 grit the polisher brought an instant deep shine. Chuffed with my success I chose a ‘hangover free’ morning to fit the decals; after struggling for half an hour all ended well. 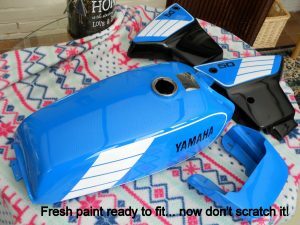 The side panel graphics are a doddle compared to the tank, fortunately I trusted the professionals at Yamaha FS1E & Small Two Stroke Restorations in Canterbury to apply our factory blue with all the trimmings. March had arrived, and I chose the Sunday morning storm Freya landed upon us to collect the tank and seat panel from deepest Kent; but it was worth the trip and the £250 outlay. The finish is excellent with a deep shine that can only be achieved with the right equipment and the talents required to use them. We removed the speedo (for a clean-up) then refitted it alongside a new ignition switch (Wemoto £16.33) as the old one had been butchered with a screw driver. The next stage would be to refit the head stock with fresh grease and bearings, a simple enough task providing you don’t drop the balls during the process; they immediately disappear never to be seen again. Meanwhile, my mate found a sheared stud on the flasher relay bracket and any excuse to get the welder out he set about grinding the remains flat before drilling out and tacking a bolt into position. This was a quick fix as was our new rear mudguard that required some adjustment before that accepted the rear light/number plate bracket. In went the rear wheel and we refitted the original chain as it’s in ‘as new’ condition, the packaging grease still enclosing every link. A new chain guard came with the bike when I bought it and looks great but the threads for our securing bolts were full of chrome; Alan recut those and it slid into place nicely. 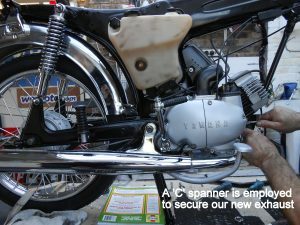 As the new parts box was emptying I took the chance to attach our period correct handlebars; a NOS part from YPV Spares, not cheap at £35.00 but a must if originality is your aim. Grips would also be sought and here we strayed a little from factory with a pair of Yamaha DT copies; on line at around £15. The FS1 enjoys the auto-lube system but initially we won’t trust that, so two-stroke container has been drained and cleaned; until reliability is guaranteed we plan to mix in the tank. 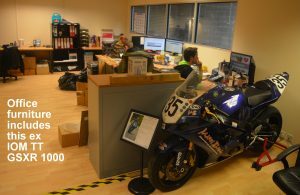 Not many offices enjoy an ex-IOM TT bike to admire over coffee breaks but the Wemoto facility is far from normal and for your average enthusiast it must be a great environment to work in. I arrived armed with a long list of parts taken from their website; handily they list per model and year, so once the FS1M 78-90 was selected the rest is straightforward. I asked my tour guide John Younge how do they source the thousands of items to cover the daily trade counter and internet sales? He explained that specialist buyers check products from shows in the Far East to smaller niche suppliers across Europe and Turkey, selecting a constant flow of incoming parts. The challenge surely must be maintaining the quality with such large quantities arriving? As John pointed out, with Wemoto franchised across Europe and as far afield as Australia their bulk buying power is huge; ‘making suppliers aware of that quality is paramount keeps the standards high’. 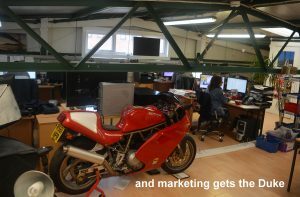 Being internet based is not just about supplying parts from their site, social media contact with customers is covered with a healthy Facebook following plus a regular newsletter. As customers’ desires change (and us bikers can be a finicky lot) keeping updated with stock requirements can be challenging and feedback from riders is positively encouraged; let’s be honest, they want to sell what you want! Classic rims and spokes are one area that Wemoto look to expand, also their paint mixing scheme with spray can option is up and running. 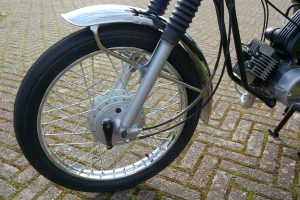 The fork stanchion racking is several deep, something to consider with chrome plating restricted to just a few outlets in the modern era. Need brake lines for your classic? Supply the dimensions and they can be constructed onsite, in the colour of your choice. Certainly, they cannot stock all the parts for every bike but what of their classic bike coverage? 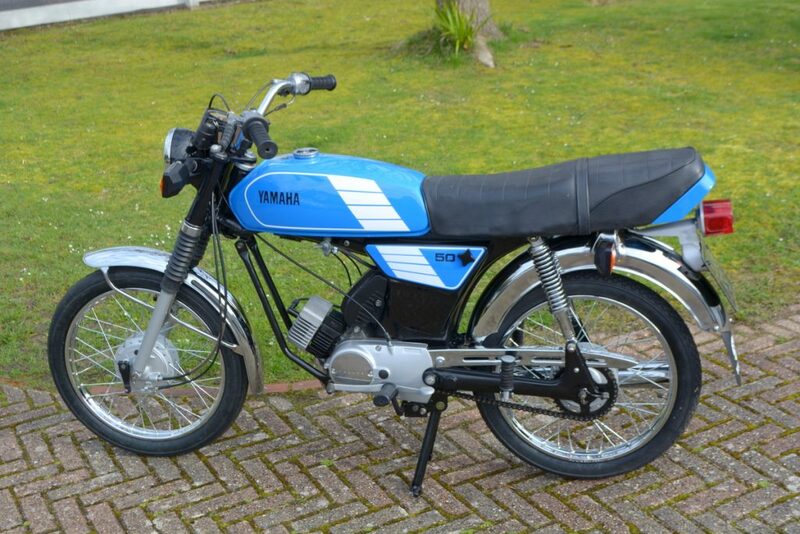 At random I selected the Guzzi V50 Monza from 1979-84 and tested their supply? Head bearings, brake pads, service items, Marving exhausts and fork springs and stanchions plus much more; within days of your doorstep. Therefore, my list of parts for our more common Fizzy shouldn’t be too much of an issue; and it wasn’t. Twenty-two items from exhaust to ignition switch and mud guards to tyres, all coming in at just under £233 and waiting for my collection at despatch; with an invite to return and some free stickers I drove home both happy and impressed. Another bonus when buying the FS1 came when the seller threw in a pair of spanking new shock absorbers which I secured with new dome bolts that we buy in bulk from some bloke in Hong Kong; a ‘C’ spanner then adjusted our shocks to the overweight old bloke setting. 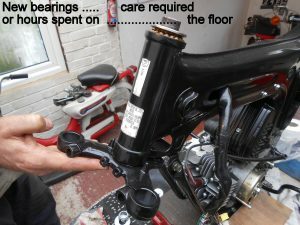 We tried to fix the broken rear brake light switch but a new one was the only way and the same situation involved our kickstart; the original example had lost any bling years ago so at just £12 a shiny version arrived via YPV Spares. 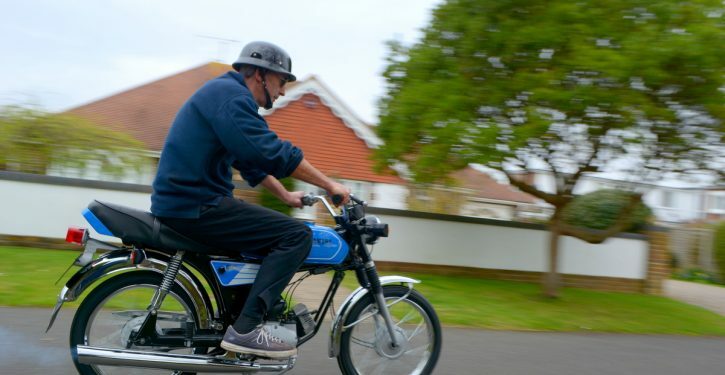 Alan wasn’t going to let me take all the glory jobs and he grabbed the ‘top-fit’ and attached the heavily chromed exhaust which I collected from Wemoto; great value at just £42.00 with gasket and certainly one aftermarket part that exceeded our expectations. To progress any further the forks needed to go in; as previously mentioned several times the seals had different ideas. After many attempts at conventional methods Alan got drastic and punched a pair of small holes either side of the seal and with a heavy duty ‘Pick’ ran a line through the centre from hole to hole. The process took an age but allowed the inner ring to be forced up using the stanchion to ram it free; from there it was just a case of collapsing the outer ring without scoring the leg itself. With the first one complete he took the second fork away in the hope of repeating the process; the delay had put us behind but at least we could now fit new seals followed by a repaint of the lower legs. 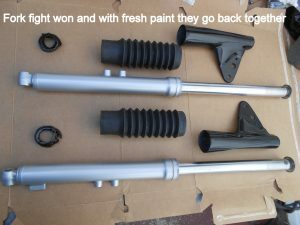 The existing springs carry plenty of rust but were hidden beneath the original gaiters (which had split) thus we took the chance to clean up and paint before refitting within new gaiters via YPV Spares at just £11.50. 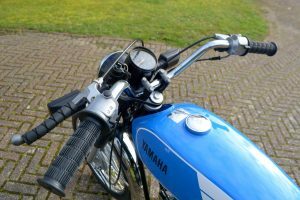 Luckily Yamaha’s wiring looms are easy to follow, and we had re-wrapped the loom in fresh tape before installing, so once Alan had sorted the tiny 6-volt battery our chance came to check the rear lights. 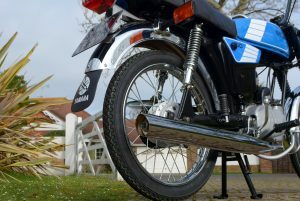 So far so good, next a new clutch cable from Wemoto (£9.95) meant the side cover and gear change could be fitted and adjusted before a ten-minute fight attaching the left-hand foot rest also from Wemoto at £7.81. A ‘just in case’ fuel filter is cut into the new fuel line, the old one was brittle and had ‘leak’ written all over it and I took time to strip and clean the original fuel tap before that went back onto the tank. Freshly painted the seat panel takes just four nuts to secure; all the seat fixings are new and now we have a large bowl full of original Yamaha nuts ‘n’ bolts all rusting quite happily. With our saddle secured we finished a very productive day by test fitting the side panels, this should have been straightforward but one of the cover screws proved a fraction short. A slight trim of excess plastic with our Dremmel concluded the day and left us enjoying a cheap beer and admitting how clever we had been; but all joking aside this project was starting to resemble the Fizzy visualised all those months ago. Assembling the forks and then installing them without assistance can be a challenge; unless you have three hands. The spring is ‘cupped’ inside the new rubber gaiters from above and below and the rubber attaches to the lower leg topped by a chrome trim. As this is slid through the lower ‘pinch bolt’ another chrome ring on top of a rubber spacer holds the cone shaped headlight bracket; all this needs to be held in place with the fork stanchion fully extended to accept the top securing nut… fiddly. The forks oil capacities vary depending which source you get the information but the manual quoted 150mls (we filled ours with a syringe) of 10w/40 mineral oil; this also lubricates the transmission. 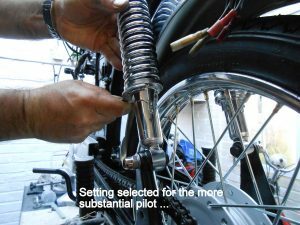 In went the front wheel and once we adjusted up the brake it became obvious the cable had stretched over the years so another was sought in a hurry but there is plenty of choice on-line. It should have been straightforward, but these things never are. 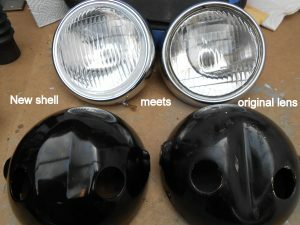 A new headlight (YPV Spares £19.00) included a copy lens that just didn’t ‘cut the mustard’ whilst our original example enjoyed a factory glass, thus a bit of mix and match produced what we were looking for. With this in place, the final wiring could be connected, and a dim neutral light appeared confirming the battery had lost any enthusiasm long ago. We did however have enough power to try and start the old girl but all my efforts with the kick-starter produced nothing but a pool of fuel on the ramp. We stripped the carb several times before the leak eased and with Alan’s fat thumb stopping air diluting our fuel-air mix she fired up and sounded great! We had a runner along with a list of issues that included an exhaust blow where the gasket couldn’t cope, a dead battery, miss-wired indicators, permanent full beam warning light and the flasher relay failed to click. Added to that the 16mm Mikuni decided to throw up its contents again, this was eventually traced to a missing ‘O’ ring that someone has replaced with a fibre washer. 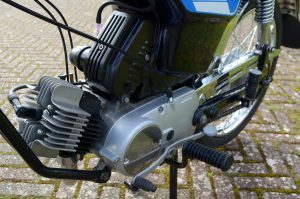 The exhaust didn’t sit flush so drastic action was required to lengthen the mounting point with a file; being a pattern part adjustment should be expected. Meanwhile, a new ‘gel’ battery arrived and confirmed we had a wiring miss-match or earth issue somewhere, so I fitted the new front brake cable which confirmed our belief, the original was stretched beyond use. 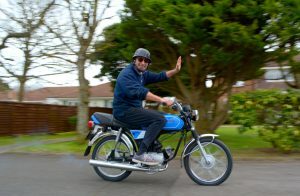 Considering all the planning involved in our maiden ride it should have gone without a hitch but firstly the clutch enjoyed a sticky moment then the rear brake offered the stopping potential of an oil tanker. Several alterations concluded with our Fizzy ticking over happily just waiting for its first victim; I nominated Alan to be crash test dummy and he disappeared in a haze of blue then returned wearing a large grin. He reported an improvement with every venture up the road, in fact I thought he wasn’t going to share and after fifteen minutes I flagged him down. His reply was a Mussolini type wave/salute as he blasted past at around 20mph before finally it was my turn. I had forgotten how rapidly the gearchanges come around, requiring the speed of a Riverdance performer so as not to ‘over-rev’ and I can confirm late 20’s flickering on the speedo but not wishing to push my luck I called it a success, parked up and opened a cold one. So, now it’s completed have we resolved the myth of the Fizzy? 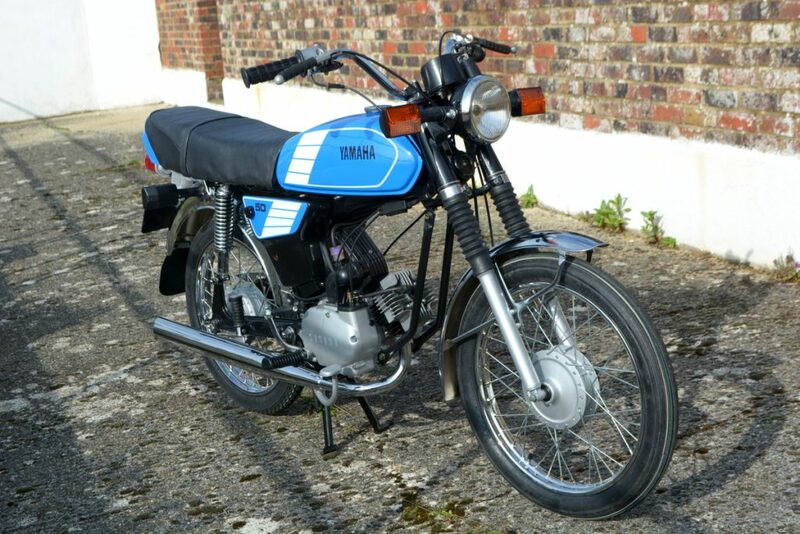 To be honest, our little Yamaha still offers nostalgia, it looks great and everyone and his dog want to talk about their teenage moments. In reality, if it was slow back then the chances of any performance improvements with my 15 stone aboard are limited. For anyone considering a similar resto this one has confirmed several pointers I received at the start. 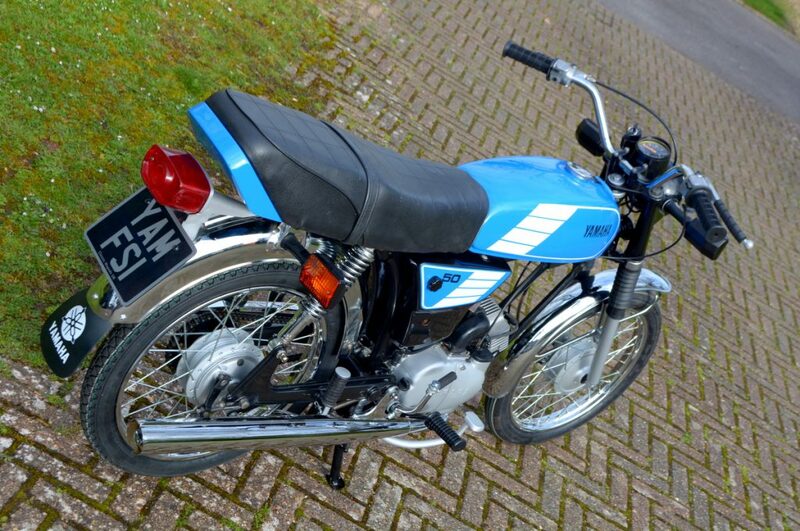 Finding an original example is unlikely, they are expensive to obtain either as a basket case or showroom fresh, but the parts supply is far better than other ‘peds’ and are great value providing you find the right vendors but be prepared to modify and make fit.